I’m dressed for comfort: t-shirt, swim trunks & barefoot. Dog wants to frolic. I step out with her. Got my iPhone & Kindle w/ a cold, icy drink. Im basking in my natural sauna taking it easy. 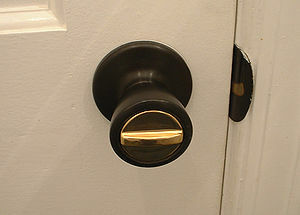 I reach for the door knob, yikes! Locked out no key – not good. We had just changed the locks. Wife’s been saying the new locks have a problem. I said, I always carry a key. impromptu event set me up for failure. Called daughter who bailed me out. Cool and comfy again just minutes later. Wearing a key from now on. Hope you got a chuckle out of this true story.